Playing With Fire returns to the Omaha riverfront’s Lewis & Clark Landing Saturday, July 28. The show is made possible this year by a last-minute presenting sponsorship from FirstComp Insurance. The performers have been announced. Headlining is Rick Vito & The Lucky Devils. Vito’s been a sideman for artists including Bonnie Raitt, Fleetwood Mac during their Tango in the Night period and The Mick Fleetwood Blues Band. That’s Vito laying down the slide guitar on Bob Seger’s iconic “Like a Rock.” Vito has also performed or recorded with Albert Collins, John Prine, John Mayall, Rita Coolidge and Little Richard. Check rickvito.com. The second act is Austrian vocalist Meena Cryle. 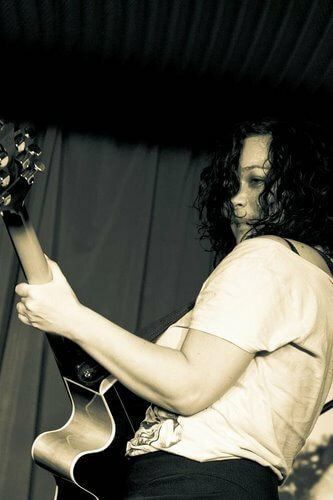 Meena & The Chris Fillmore Band were runners-up in the first-ever European Blues Challenge in 2011. She toured as part of Ruf Record’s Blues Caravan with artists including Coco Montoya. See meenacryle.com. The 21st Saloon Thursday shows are cookin’ with festival-caliber talent each week at 5:30 p.m. Boogie-woogie and blues keyboardist Kelley Hunt plays Thursday, March 1. Grammy nominee, multiple Blues Music Award winner and four-time BMA nominee this year Tab Benoit rocks the Thursday, March 8, show. You can’t go wrong with Lincoln’s Zoo Bar House Band on Monday’s 7-10 p.m. featuring a rotating cast of Lincoln’s best roots players. Friday, March 2, catch The Mezcal Brothers 5-7 p.m. And though this correction did not make it into the print issue of this column, the Lil’ Slim Blues Band has decided to retain their name after flirting with the idea of changing the band name to the Shawn Holt Blues Band. The Lil’ Slim Blues Band plugs in at 9 p.m. on Friday, March 2. My hero-pal and Austin icon Jon Dee Graham called Lil’ Slim “a mountain of soul” after Graham sat in with the Zoo House Band, which included Shawn Holt, in mid-February. Saturday, March 3, catch the funk of KC’s Good Foot with Making Movies. Tuesday, March 6, it’s Sons of 76 with the Americana-pop of The Mynabirds and The Sleepover. Hoodoo favorites Studebaker John & the Hawks bring old-school Chicago blues featuring some killer slide guitar to the stage Wednesday, March 7, 6-9 p.m.
Folks are buzzing about The Lauter Tun, a new venue at 3309 Oak View Drive. The focus is on jazz and acoustic music. Check thelautertun.com for info. The OK Sisters play P.S. Collective inside Benson’s Pizza Shoppe Saturday, March 3, 9-11 p.m. Meanwhile, Saturday, March 3, offers two up and coming local bands playing free shows. Catch Matt Gagne & The Blues Experience at Tin Lizzy’s in Fremont. Over at McKenna’s the Back Alley Blues Band plugs in. Waiting Room hosts another Hootenanny Sunday, March 4, 5 p.m. Performers include Matt Cox, Gerald Lee Jr., Kate Williams and Southpaw Bluegrass Band. See waitingroomlounge.com.